Certified professional dog trainer and pit bull owner shows you how to train your pit bull and stop annoying behavior problems. 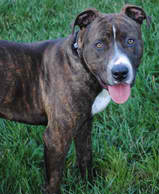 Over the next few minutes, you will learn how you can have the best-behaved pit bull on the block. Guaranteed! I’m not a professional writer. I’m a Pit Bull owner, fancier of Pit Bulls, and a professional dog trainer but what I have to say is so important that I decided to sit down to write you this message the best way I know. Lately, I’ve had a lot of people asking me about Pit Bull ownership and how to raise a well behaved Pit Bull. Even though I tried sitting down to write a well thought out article with proper grammar I can’t do it. So I finally figured I would talk to you as if we were sitting down enjoying a cup of coffee together. I’d like to tell you about the most important thing every Pit Bull owner can do for their dogs. So what is the big secret? Obedience training. Simple right? Well after receiving literally thousands of emails asking me how to raise a well-behaved Pit Bull it was apparently clear, to me at least, that obedience training was being overlooked by the majority of Pit Bull owners. Obedience training along with giving your Pit Bull rules to follow will solve 99% of the behavior problems you will face and make training your Pit Bull easier than you ever imagined. If you’re like most owners you’re looking for a way to train your dog and solve behavior problems while earning their respect without hurting them or “forcing them”. How you can have a well behaved Pit Bull by tapping into their natural instincts. Why 95% of the advice you get about training your Pit Bull is dead wrong. How to easily communicate with your Pit Bull. This alone makes life so much easier. How to maintain good behaviors forever using simple positive methods. Before we get to that though I would like to tell you a little more about myself. I have been working with dogs for 10 years now. 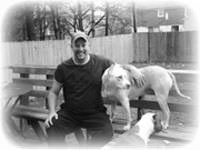 I am a professional dog trainer living in Lexington, Ky. I am certified by the Certification Council of Professional Dog Trainers (CPDT-KA) and Animal Behavior College (ABCDT). I have worked with hundreds of dogs. It just so happens my breed of choice is the American Pit Bull Terrier (aka the Pit Bull). 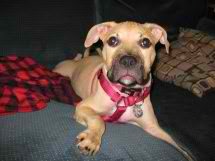 I started learning about training when I purchased a little Pit Bull puppy who I named Angel. Angel was, well, a challenge for me and at the time I had no idea about training or the incredible hysteria surrounding Pit Bulls. Angel was a nipping nightmare. She would bite, nip, knaw, chew, and it was not easy to get a handle on. I decided I needed some help so I hired an obedience trainer who came to my house once a week and we started working with Angel. After two lessons Angel was scared of me. I didn’t understand what was going on. I was doing everything I was told to do. It dawned on me that the method of training I was being taught was ruining my dog. She was not mature enough for corrections using a prong collar so I chucked the prong collar into the garbage and started learning about positive training. After a few short days, Angel was back to normal, loving training, and I really enjoyed training her. Over the next few years, I worked with Angel and created what is now one of the largest Pit Bull related websites online, Pit Bull Lovers. Through Pit Bull Lovers I starting receiving hundreds of emails about training. Things like how to train them to sit, stay, lay down, stop jumping, mouthing and a host of other behavior issues. Honestly, I was humbled and quite frankly I was overwhelmed. I started receiving thousands of emails per week and I simply could not answer them all. This leads me to why I’m writing you today. In my wildest dreams, I can not answer every single question that I receive about training Pit Bulls. So I decided to sit down and put all my training methods, handling principles, and behavior modification tips into one, simple, easy to follow, guide. Thus, The Pit Bull Training Handbook was created. After nearly ruining my dogs with compulsion training (aka force training) I discovered how to use their natural drives, along with the motivation to create a one-two knock out punch that makes training so much more fun and less stressful. Once I discovered these techniques I immediately started applying them and my dogs’ behavior changed virtually overnight. Needless to say, I was sold. I use these techniques on a daily basis in my dog training business and when it comes to Pit Bulls they work like a charm. Through working with my own dogs and many other Pit Bulls I discovered three things. Pit Bulls do not need harsh or forceful handling in order to train them. Pit Bulls have above average “prey drive” and you can tap into this to make training a breeze. Pit Bulls are highly trainable, smart dogs, that with some positive reinforcement and well timed praise can do almost anything you ask them to. Inside The Pit Bull Training Handbook I share the exact methods I used to save my relationship with my own dogs along with how to make sure you do not make the same mistakes I did. Not only did training basic behaviors like the sit and the down become easier but behavior problems became a thing of the past. Wouldn’t be Nice to Stop These Annoying Behaviors Forever? Chewing: Pit Bulls are life long chewers. This section will show you how to safely teach your dog what is okay to chew and what is not. Jumping: One of the most frequently asked training questions I receive is, “how do I stop my dog from jumping?” You’ll learn how to keep your dogs paws on the floor in no time flat. Leash Pulling: Tired of sore muscles? When you use this method for leash training you get lasting long term results. Not Coming when called: The Recall is literally a life-saving obedience behavior every dog owner should teach their dog. You’ll be envied by others when you call your dog one time and they come without hesitation. Nipping and Mouthing: Using the tips in this section will save you and your fingers a lot of pain. Using the bathroom in the house: I personally house trained my dogs using these exact same methods in 7 days. While I can’t guarantee it, I’m confident you’ll get similar results too. Who Else Wants Their Pit Bull to Come When Called Without Having to Chase Them Down? As I told you earlier Angel was becoming scared of me because of the training methods I was using. I hated the feeling that I was causing her stress and this resulted in lackluster obedience. Coming when called was especially difficult because she didn’t trust me anymore. After re-training her to come to me when I called her using the methods outlined in The Pit Bull Training Handbook the result was nothing short of amazing. You can get the same results without having to fight or chase your dog around. After only a few sessions I’m confident your dog will trust you more and, this is important, they will also want to come back to you when called. What separates a good response to coming when called from a great response to coming when called? Motivation. You’ll learn how to create motivation in your dog so they seek you out instead of you having to play stop and go with them all day. Now you can tap into years of result based training techniques and information. Everything is presented in a crystal clear, step-by-oh-so-careful-step manner so you absorb the information and apply it. “I LOVE The Pit Bull Training Handbook, and it’s an invaluable tool! This is my Pit Bull. His name is Axel, and he’s about 11 months old. He lives in Newport Beach and shares space with his owners, and 2 cats. He used to eat sofas, but Jason Mann’s training book helped his owners realize he was just bored. He’s VERY attentive, has a great sense of humor, and he doesn’t want anyone to know the cats actually rule the house. “Hi Jason, I am so glad I ordered your book. It is excellent. I read it (with just a few interruptions from Lily-my pit bull) in a couple of hours. I took a break one time to teach her your technique of lying down. She got it the first time! She’s very smart if I have to say so myself. She is a rescue puppy from the Humane Society in the city I live in. She is 4mo. old. “My name is Novella Myers and I recently signed up to be a member of your site. I then got the Pit Bull Training Tips for 5 days and I must say that I noticed an improvement in New New’s behavior almost immediately. While she’s still just a puppy (9 weeks old) she now sits on command and will remain there for at least 2 minutes. And she also waits for her food, she used to practically knock bag of food out of my hand and now she’s just as well mannered as can be expected (for her age). But I just have to tell you that I was at the end of my rope as far as her behavior was concerned and then I got your book and it just put everything into perspective for me. I just want to thank you and New New thank’s you as well!! Jason’s book can be used to train ANY dog but I highly recommend it for Pit Bulls. I have read his book, front to back, at least 3 times; and I still refer to it. With that said, my husband Rick, myself and Launi have accomplished incredible things in less than 3 weeks. Let me tell you. I used the Introducing Your Puppy. I have 8 dogs. Bringing in a 22 pound puppy with energy, playfulness and strength made it crucial to follow his instructions. I left that page open on my kitchen counter for 3 days. It is important to pay close attention to everything he writes; because it works. I would like to say if you follow Jason Mann’s book, you will have a very happy, balanced and trained dog. Remember the things he writes are tried and tested. Train your Pit. Exercise your Pit. Create boundaries and limitations and last but not least, love the heaven out of your dog! “Last April my husband and I adopted a 2 year old pittie from a shelter. We had each had dogs growing up but no experience whatsoever with this breed! Thank God for Jason Mann! The book provided certain clear directives, in more detail than we could find elsewhere, which helped right away with the heel and other training/behavior issues. The website, with the hundreds of other pitbull lovers (somehow, you can’t help but fall in love with these dogs) including the site “supervisors” who have loads of experience was critical, when it became clear that our baby had some dominance/aggression problems to solve, and we might have given up, but for their input. We are working with a local trainer now as well, but that’s only once per week, so the videos are crucial. We watched the first one last night. There are some things (like TIMING) which no matter how much you write about it, must be demonstrated in real time, as well as position, and dog body language which you can see on video. “On the first training session my hyperactive, but friendly 10 month old America Pit Bull rescue shelter dog is already following the sit and lay down and just starting to obey the stay command and is now walking on a leash almost like a show dog and fetches a bone. We have only owned him for 5 days now. I wanted to personally thank you for your dedication to the Pit Bull breed. There are many training books out there, but I knew when I was looking for one I wanted one that was specific to the breed, not just a general training handbook. As you know, the Pit Bull has a very distinct personality which requires special attention and needs. That is why when I came across your website and book, I knew immediately that it was what I had been searching for. By purchasing your book, not only did I receive step by step instructions, advice, and tips (specific to the breed), on training my new Pit Bull with positive reinforcement (which is perfect for this breed), but I was found that I had membership access to an entire network of other Pit Bull owners whom I could contact for other opinions and advice, and whom I could share mine with as well. It is like the pool of Pit Bull specific info doesn’t end. I now find that I have access to audio training. Anyone could use this training info for whatever kind of dog, but if you are a Pit Bull owner, or are even thinking about owning one, this is the only way to go. “Jason, I just can’t get over his response to all of this. He even seems to be happier which in turn makes me extremely happy and satisfied with everything I have done with him and everything that he has accomplished. Your training tips have really made a difference for me and my little guy and for that I want to thank you again. Even though I had been working with him prior to this, he had never responded like he did with your training techniques. My little guy no longer seems to be nervous to come to me and all of the positive reinforcement has done wonders for the both of us. I got your book. It is a wonderful source of information. I will be ordering another one today for someone that is taking care of 4 rescue pit bulls. Your book contains all the necessary information on how to properly take of our pit bulls. It is easy to read and it is filled with tons of important guidelines and tips. I just purchased The Pit Bull Training Handbook and finished reading for the first of many times that I will read the book. Since it is in a digital format, I can leave the Adobe program minimized while I am working and go back and forth as I can. After reading, I have realized all of the mistakes that I am making with my 11 week old Nudge and feel like I am a more aware and smarter pitbull owner. By now you must be wondering “how much is all of this going to cost”? Actually, it’s not a cost; it’s an investment in your Pit Bull. Listen, people pay me fees to help them train their dogs… $100 for one hour of personal one-on-one training to be exact. Simple: I don’t sugarcoat anything, I tell it like it is and then provide easy-to-follow instructions that steer you around all the headaches and roadblocks associated with training your Pit Bull. In The Pit Bull Training Handbook I spill the beans completely… every scrap of knowledge and insider tips I have to share about training. Including powerful, proven tactics that I use on a daily basis in my professional dog training business. A complete ready-to-use resource. It stops the frustration and you are now training your Pit Bull faster and easier than ever. Then, you come back stronger, wiser, and with solid skills, you can apply to maintain your dog’s behavior. Not to mention reclaiming the respect of your dog and your sanity. But you don’t have to pay me $100 an hour because I’m making this available for everyone who needs it. I couldn’t personally work with the enormous population of Pit Bull owners around the world anyway. Claim your digital copy of The Pit Bull Training Handbook + BONUS book Pit Bull Health Secrets: Just $17! The fact is, I could just sell each piece of this offer separately. But it wouldn’t feel right. That’s because it’s vital to share this exclusive Pit Bull training offer with people who will truly apply it. And even if I only help one person train their Pit Bull, all the months of time and effort it took to write the books and will be worth it. Now, if you’ve read this entire letter, it’s obvious we’re talking “peanuts” for the training know-how you will be acquiring and putting into action. Access to proven, time-tested, training methods you can use again and again. Skills that will help you maintain your dog’s behavior for years to come! The knowledge you can share to help others in need. P.P. : Have you ever conquered a critical problem in any area of your life? How wonderful did that feel? Do you remember? Makes you feel almost superhuman. That’s what learning how to conquer your Pit Bulls training feels like. You don’t have time to “think about it” if you’re having problems right now. If you do, your choices will start evaporating. I know from experience.